Once sampled, always sought after. 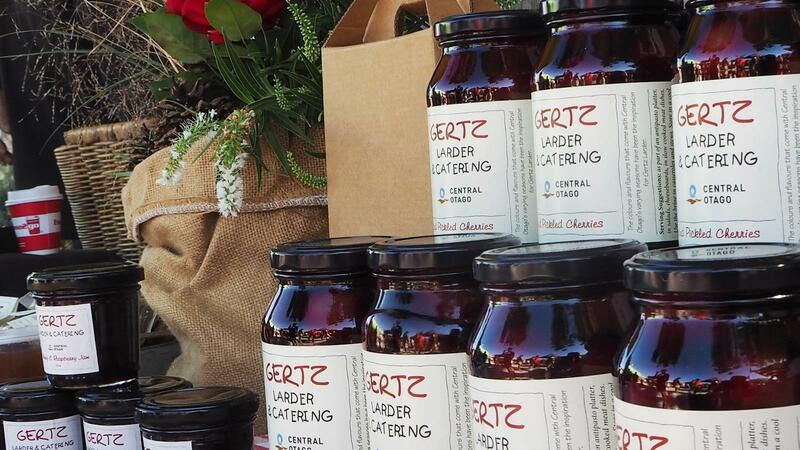 Gertz Larder products can be found at fine stores and at the local Cromwell Farmers’ and Craft Market—showcased with the best, freshest seasonal produce. A true artisan, Glenda is creator, owner, marketer and stallholder. She’s connected at every business step. Forty years ago Glenda moved to Cromwell from Dunedin. After training in book-keeping, she decided to pursue her love of cooking in local hospitality, gaining knowledge and inspiration. In her spare time, she toyed with flavours, creating heavenly recipes that celebrate local produce. In 2009, an award-winning, speciality range of condiment treats called Gertz Larder was born: Central Otago in a bottle. I slowly slipped into cooking, learning from good chefs the importance of the balance of food and the final impact that flavour can have. My daughter said to me “Mum, why don’t you go to the Cromwell market?” My first thought was “Who is going to want to eat my food?” My early products were lemon curd, aioli and infused olives. On the first day I sold $45 worth of product before the market opened—I was so delighted! Gertz Larder pays homage to Central Otago’s plentiful produce while gifting an inimitable flavour twist. Glenda’s vision is to honour the fruit and share her passion for Central Otago’s splendid produce. Cherry, pinot noir, apricot and crab apple—vinegars that capture Central Otago’s iconic fruit flavours. There’s also the pickled onions suggested by a friend. How could I incorporate pickled onions into local? At the market I got to know our local honey producers. That’s how I came up with thyme honey pickled onions, my bestseller. A Christchurch truck driver rang me and said `Glenda, your pickled onions—I usually pick them up on my way through Cromwell but I can’t get them. I want five jars.’ I also make a 150th gold rush commemorative pioneer pear sauce, it’s a mustardy, goldy colour—so like our gorgeous Central Otago autumn colours. Collaboration and respect for the hard graft and achievements of others are concepts at the heart of Gertz Larder’s business philosophy. Sharing the love gets results for all. We have quite a few jam, chutney and preserve producers at the market. We’re working together to help each other. You know, `where are you getting your jars from?’ `Make sure you get in on that deal’. It’s like a family really. It’s a community approach and it’s the only way a community can grow if you’re working together like that. It’s all about the sharing. It’s a small community and we’re in close contact with the growers—five minutes in the car and you’re at an orchard. We’ve all got the same passion about what we’re doing and we’re all in it for that same reason. Gertz Larder shares the pleasures of Central Otago’s delightful flavours in an open, honest and friendly way. Their wonderful creations are produced with the utmost integrity. You taste it in a bottle when someone makes something with passion. People think “That lady is passionate about what she does, it must be in that bottle.” That’s a huge belief of mine. I like to talk with people to share Central Otago flavours in the hope that their unique qualities are better understood. And the way our seasons treat the fruit—it does have an effect on the flavours. You do try to influence others. Try the pickled onions, there’s the honey producer over there. And I love to do that and promote others as much as myself, if I respect their belief and what they’re doing.